Yours Truly. My specialties are curly hair and mischievous looks. I noticed you’ve got curly hair, just like me. I was wondering what products you use? Over the years, I’ve gone through a number of phases in my relationship with my hair. (I blogged about it a few months ago, if you’d like to read it. It’s a bit wordy, so consider yourself forewarned…) But yes, my hair is definitely curly and rather full. 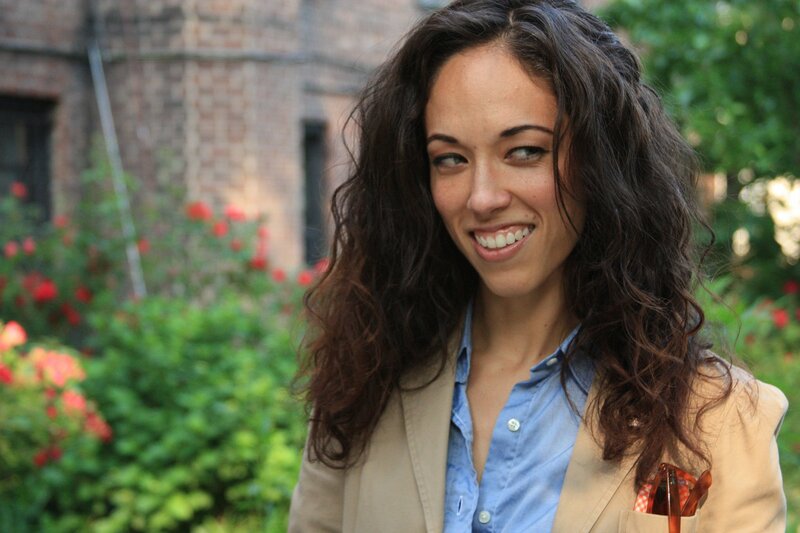 I had a Brazillian Blowout back in the winter, which rendered my hair completely — amazingly! — straight. I loved it and completely recommend it for curly girls who want wash and wear straight hair for a couple of months. It gradually has worn off and this summer I am rediscovering my love for my curls. You can see the current state of my locks above. Never ever EVER brush your curls…unless you want to look like a poodle. Curly hair should be combed through when soaking wet, and left to its own devices after that. I only use my fingers to style my hair after it is dry. Curly hair is thirsty. After you think you’ve put in enough product, add more. And don’t be afraid to double or triple up on your products. At present, I’m working with three or four to get the curls you see above. In the shower, be sure to use a good conditioner, as dry hair invites frizz. Lastly, unless you have super oily hair/scalp, don’t wash it every day. Try going a few days. If you absolutely can’t go without washing your hair, try merely rinsing and lightly conditioning it. Air drying is always best. Lastly, find a stylist who understands curly hair. In New York, I go to Angela Soto at the Whittemore House Salon in Greenwich Village, and I **highly** recommend her. She’s amazing. So what’s on my hair right now? 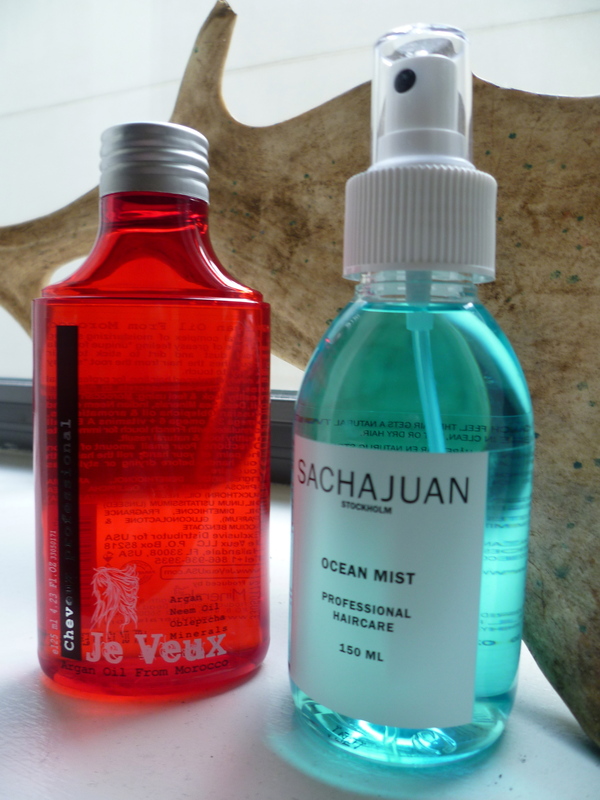 The two products you see above have been a godsend to me this summer: Je Veux Argan Oil and SACHAJUAN Ocean Mist. Both were recommended to me by Angela, and can be purchased at the Whittemore House, if you’re so inclined. I especially like the Je Veux because it conditions my hair without weighing it down — a problem I had when I tried using pure argan oil. The Ocean Mist does an excellent job of defining my curls, especially in the morning after I’ve slept on them. I’ve also heard good things about Fekkai Beach Waves and Bumble and Bumble Surf Spray. Air dry. Once dry, finish off with a bit of hairspray. I love Elnett. Hope that helps. Do let me know how it goes for you! “I am always on the search to uncover healthy, holistic solutions to heal the body. I discovered argan oil and its multitude of uses last year, and have been hooked ever since. This amazing oil keeps my skin young and healthy and looking fresh. It can also be used to re-hydrate the body, reduce fine lines and wrinkles, and soothe skin ailments such as acne, psoriasis, and eczema. It can reduce appearance of scars and stretch marks, moisturize cuticles, and it’s a great way to nourish and add shine to your hair. I also dab a little on insect bites in the summer to heal quicker. For help with organic questions and holistic health tips, you can visit Tara at her website, Green Tara Wellness. Way to go ladies….I have the in between hair of straight with lots of body. It needs to be tamed and without a good product it for sure does not cooperate. I am going to try these oils. My hair dresser suggested olive oil as a deep conditioner, only problem is you need a touch of vinegar to wash it all out. Seems counter productive to me? Oil then vinegar, hmmm…I’ve actually never heard of that! Have you tried it? It definitely sounds counterproductive to me, as well. Not to mention the fact that I would definitely be leery of the vinegar smell sticking around…. Let me know how you find the argan oil? You are currently reading Ask Me Anything: Curl Tamer at Quite Continental.